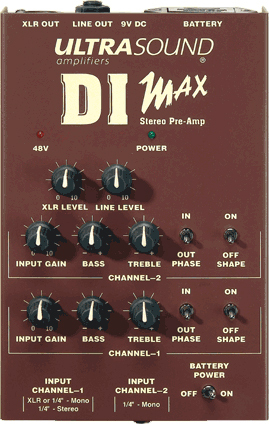 DI MAX is the most versatile instrument pre-amp on the market. With 2 independent channels, the DI MAX can be used as a blender as well as a pre-amp. The Channel-1 input will accept 1/4" mono as well as 1/4" stereo (TRS) inputs which allows the DI MAX to process the "tip" signal through the Channel-1 controls and the "ring" signal through the Channel-2 controls giving you an enormous amount of flexibility for creative signal blending from your stereo pickups. Of course you can plug 2 different instruments into the DI MAX and blend the signals. Channel-1 also allows the use of an XLR input so you can use the DI MAX as a personal mic pre-amp. The DI MAX lets you dial in a clear, natural sound and route it to a stage PA from a balanced XLR output. A 1/4" Line out sends the signal to your stage amp. Tone controls include active bass and treble EQ, mid-dip shape control, and phase switch. Operates on 48V phantom power, 9V adapter, or 9V battery.